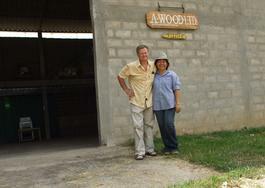 It was in the early 80's when Jan Mrskos had been frequently coming to Thailand participating on engineering projects. Finally, the consulting company he had worked with "punished" him by sending him for few years to a construction site in the North of Thailand. Being later back again in Switzerland, he decided to return to Thailand on his own. With his spouse who he had met during his assignment they enrolled into a local manufacturing of bamboo products and transformed it into a woodenware production. Attending major trade shows in Thailand, Europe and USA had helped them to become fast known to wholesale buyers. Unfortunately, within few years of the company buildup his spouse passed away. This had brought him quite a lot of legal problems resulting finally in a loss of the painstakingly developed factory to the family of his deceased wife. Within few months the company had ceased further operations, today no longer exists. Jan did not quit the scene being helped by good local friends and being fortunate that he later met a wonderful lady. Yuwaree had helped him through all the obstacles that foreigners face in such situations and invited him to join her company. At a suburb of province town Lampang they found an abandoned old factory that was easy to rebuild. With help of own workers it had not taken more than three months to get the ruins into a suitable shape ready for production. Within next years there had been few more extensions and construction of drying kilns indispensable for local acacia and teak processing. 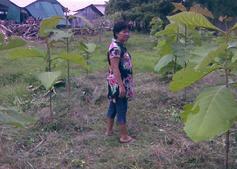 Rubber wood timber is supplied from South of Thailand, delivered in dry conditions ready for machining. An oak wood and ash wood is being imported from Europe and USA for both tableware and furniture. Many craftsmen of Jan's former company have joined the new factory. Together they have formed a good team having a flexible approach to customer's wishes. Some buyers come with very special ideas of their own design, some buyers prefer to select models from company's collections. Beside the usual models of housewares, home accessories and garden furniture there are very few cases they would not be able to quote on. Furthermore, in order to have enough wood for their future production, Jan and Yuwaree have set up their own plantation of rubberwood, acacia and teak. However, they plan to harvest the mature wood only in their next life.